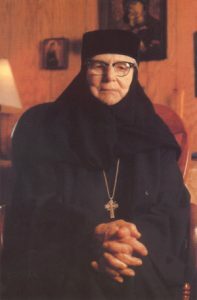 Please join us at the Lawrence County Historical Society, 408 North Jefferson St., New Castle, on Tuesday, May 14 at 7 pm when Zenaida Bench will present a program about the history of the Lawrence County Orthodox Monastery of the Transfiguration and its founder’s , Mother Alexandra’s history. This program is free and open to the public. 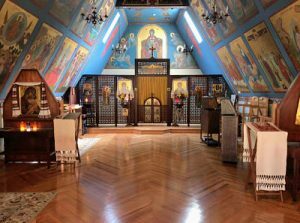 Located just outside Ellwood City in Wayne Township, the Orthodox Monastery of the Transfiguration is a monastery for women under the jurisdiction of The Orthodox Church in America. It was founded in 1967 by Mother Alexandra (the former Princess Ileana of Romania) whose dream it was to provide a place where American Orthodox women from all ethnic backgrounds could come to live the monastic life and benefit from a liturgical cycle in English. Since that time, her vision has been fulfilled. The nuns, many of whom are converts to Orthodoxy, as well as the monastery’s many visitors, span a variety of backgrounds. Princess Ileana, the youngest daughter of King Ferdinand and Queen Marie, was born in Bucharest, Romania in 1909. During her childhood, she lived through the harsh realities of World War I. With her mother and sisters, she would visit the soldiers in the hospitals and on troop trains, praying with them. She also helped the Red Cross as an interpreter. In 1947, she with her whole family, was exiled from Romania by the Communists, being told they could leave the country with whatever they could carry or be confined in a monastery until they were executed. They lived in Switzerland and then came the United States. In 1964, the property in Wayne Township, PA, was purchased, and in 1967, after Sister Ileana was tonsured into monastic life as Mother Alexandra, she established the Orthodox Monastery of the Transfiguration. She lived to see Communism fall in Romania in 1989, and was able to make a return visit to her homeland in 1990. Mother Alexandra died on January 21, 1991 and is buried in the monastery cemetery. OUR PRESENTER: Zenaida Bench, became an Eastern Orthodox Christian in 1991. After visiting the Monastery at that time, she visited every year, often introducing “this peaceful and holy place to friends.” In 1993, she earned an MA in Theology at the Ecumenical Institute in Baltimore, MD. The following year she became the assistant to the Dean and the director of admissions there. Retiring in 2017, she moved to Ellwood City where she now resides at the monastery as the resident volunteer assistant to the Abbess.